Two nights ago I watched the first third of Inside Jaws (so far). It is clear that this is once again a different kind of filmumentary. Whilst I’ll be using all the available material in a constructive way, there just isn’t the amount behind the scenes footage available. I reckon I am at about 60% or so complete at this point. Perhaps the end of February 2013 deadline is a little over optimistic. I am still to make a trailer actually so there is nothing firm about that release date. Last night I edited for an hour or so and promised myself I would do another five or six hours this week. I’ll keep you posted. UPDATE: I’ve started working on a Storyboard Comparison sequence much like the ones in Building Empire (asteroid scene) and Raiding the Lost Ark (in the map room). 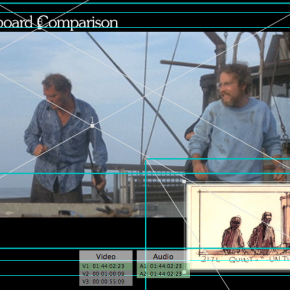 This is all thanks to the very generous Joe Alves, who has kindly sent me great scans for use in Inside Jaws. You can buy a limited print of Joe’s incredible storyboards at his site. Loved Raiding The Lost Ark, and a huge fan of the film. It’s what inspired me as a kid to do what I’m doing today. Wanted to ask you what kind of editing software you use, and what kind of computer you have to work on these projects? Can wait for Inside Jaws, one of my other fav films. Firstly, thanks for the feedback. I really do appreciate it. I use Final Cut Pro on a Macbook pro and Imac, along with a few other tools like, MPEG streamclip, Motion etc. Looking forward to getting more done on Inside Jaws in the coming weeks.